We have a range of accommodation and prices to suit. The cottage is located on the banks of the Darling River. It has three bedrooms (sleeps 6), a bathroom/ensuite and kitchen/dining. The Jillaroos Cabin is located on the banks of the Darling River. It has two separate family type rooms (sleeps 4 in each) with access to bathroom facilities and use of the outdoor camp kitchen. Both have tea making facilities. 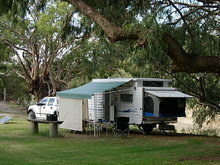 All camp sites are located on the banks of the Darling River. There are a number of sites with access to flushing toilets and hot showers and for the more adventurous a few secluded bush sites with no amenities.